Tyrone have claimed their seventh Dr McKenna Cup title in eight years with a dramatic win over Armagh. The three hand pass rule would not feature in the game after being dismissed by congress earlier today. Darren McCurry claimed the man of the match kicking nine points as Armagh finished with 13 and Tyrone 14. Armagh raced into an early 0-5 to 0-1 lead as Rory Grugan and Niall Grimley led the Orchard charge. Tyrone would go on to hit five points on the bounce with Niall Sludden, Cathal McShane and Darren McCurry landing scores to ensure the Red Hands would lead 0-9 to 0-6 at the break. The second half would prove to be a tight and hard hitting and at times frantic encounter with Darren McCurry again keeping the Tyrone scoreboard ticking while Mattie Donnelly and Darragh Canavan entered the fray as James Morgan was dismissed on a second yellow card. Armagh won a penalty with five to play as Kieran McGeary clawed an Armagh goal bound effort off the line by touching the ball on the ground. Rory Grugan stepped up to take the kick sending the ball over the bar, tipping the crossbar on the way over. Just before the game entered six minutes of injury time Ronan McNamee and Aaron McKay were sent off on straight reds. In the 74th minute of the game Niall Grimley sent a free to level wide of the target. 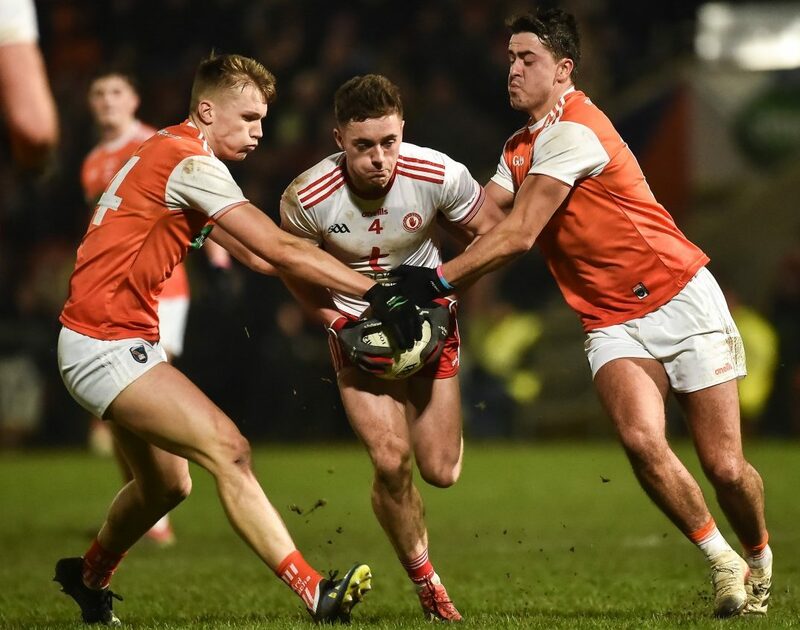 Tyrone would counter with Kyle Coney finding Cathal McShane who claimed an offensive mark before pointing to seal the victory after a nervy finish. Tyrone: Niall Morgan (0-1 1f), Ciaran McLaughlin, Ronan McNamee, Liam Rafferty, Tiernan McCann, Aidan McCrory, Michael Cassidy, Conan Grugan, Declan McClure (0-1), Niall Sludden (0-2), Ronan O’Neill, Conal McCann, Darren McCurry (0-9 8f), Peter Harte, Cathal McShane (0-2). Armagh: Blaine Hughes, Connaire Mackin, Ryan Kennedy, James Morgan, Ruairi McCaughley, Brendan Donaghy, Greg McCabe, Stephan Sheridan, Niall Grimley (0-5 2f 1 45’), Jemar Hall, Rory Grugan (0-3 3f), Ryan McShane, Stefan Campbell (0-2), Rian O’Neill (0-1), Jamie Clarke (0-1).